Grevillea triternata is an often straggly shrub reaching a height of 1.5 metres. The straggly growth habit may be slightly modified by tip pruning. Light green leaves are divided into threes either two or three times. Leaf segments are crowned with a sharp point. White flowers are carried in dense, cylindrical, terminal racemes. Blooms are carried mainly from August to November with a few flowers present throughout the year. This is not the most spectacular grevillea. Because of the dense, prickly foliage G. triternata would be a useful addition to a bird-friendly garden. The foliage provides safe nesting sites. 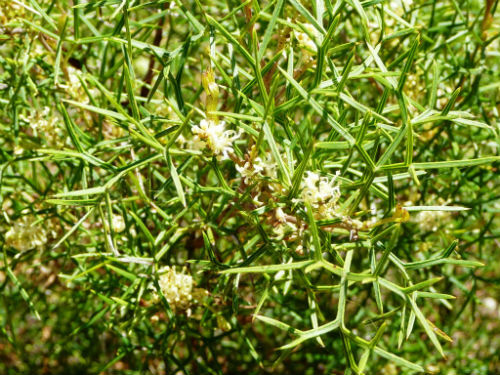 G. triternata is found on the Coast, Tablelands and Slopes of NSW. The type was collected in Port Jackson, Sydney in 1817 and named in 1830. The species name refers to the leave’s three divisions. G. ramosissima is similar but differs in the size of the leaf segments.